“He is a horse we have always liked” said Michael Moroney of the promising Air Striker who found the line in smart fashion at Benalla on Monday. Coming off a heavy track failure at Ballarat his previous start, the lightly raced four-year-old was back to his best on firmer going – jumping straight to the lead. Not having his own way in front, the Pentire gelding was taken on from the 1000m – eventually taking the sit in second placing before regaining the lead at the 400m and digging deep. The win was his second from 11 starts and Moroney is confident that the best is still to come. Air Striker is raced by Richard Smith, Bruce Mathieson, Miss Kerry Smith, R & C Legh Racing (Manager Rupert Legh), Giuseppe Pulitano, Michael Phillips, Stephen Kay and Maree Keating. He is a handsome son of one of Ballymore's favourite stallions Pentire - sire of our star galloper Xcellent and the hardy Tinseltown. Air Striker’s dam meanwhile is the Listed winning sprinter/miler Aimee's Idol. Hopefully Air Striker’s win is the first of many this week as we head to Canterbury on Wednesday and Seymour on Thursday. 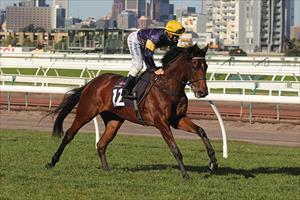 At the Sydney midweeker we saddle up two runners, the first being Point Made in the TAB.com.au Handicap over 1250m. To be ridden by James McDonald, the five-year-old is having his first run since late August and he has been pleasing us with his work. “He trialled really impressively,” Moroney said, adding that the gelding “is well forward” for his first up run. The second of our Canterbury duo is Girls On Film who takes her place in the Canterbury Handicap over 1250m. Brenton Avdulla takes the ride on the talented chestnut who was last seen at the races in late August. “Her first up form is pretty good,” Moroney noted, adding that the daughter of Pins also trialled well recently. Closer to home we have another three runners at the Seymour meeting on Thursday starting with Chobe in the Super Impose 3Y0 Maiden over 1309m. A handy fifth at his recent Yarra Valley debut, the well related gelding did a fair bit wrong. “He raced greenly which surprised us a bit as he had been very professional when trialling in New Zealand,” said Moroney. A son of O’Reilly, the good-looking Chobe is out of the NZ 1000 Guineas winner Emerald, daughter of the triple Gr.3 winner Jennifer Rush. Present Arms (pictured) takes his place in the Goulburn Valley Union Handicap and looks an each-way chance on the strength of his excellent first up run at Kilmore. On that occasion doing his best work over 1457m, the Zabeel four-year-old will appreciate the step up to the mile on Thursday. Described by Moroney as “a nice big staying horse,” Present Arms will be at his best over even more ground but from barrier four with Damien Oliver aboard can figure in the thick of things. Crimson Lady, who lines up in the Pet Horse & Farm Country Showcase has proven quite a frustrating horse for the stable but we are hoping for an improved performance fresh and back in distance. “It seems she just doesn’t stay,” Moroney said – hoping that the half-sister to 2000m Group One winner The Party Stand would get over a bit of ground.